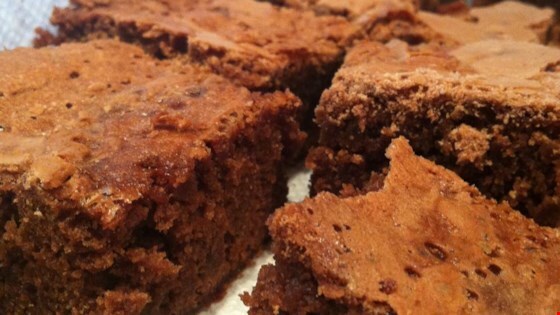 "Absolutely sinful home-made brownies. It's a double batch because they disappear twice as fast!" In a double boiler, melt together chocolate chips, shortening, and water. Preheat oven to 325 degrees F (165 degrees C). Grease and flour 2 9x9 inch baking pans. In a large bowl, mix together eggs, sugar, and confectioners' sugar. Allow chocolate mixture to cool slightly, then mix it into the egg mixture. Stir in vanilla. Finally, stir in the flour and mix well. Pour the brownie batter equally into the 2 pans and spread evenly. Spoon caramel over the tops of the brownies, using more or less according to taste. Using a small knife, swirl the caramel into the brownie batter. Bake for 40 to 45 minutes until a toothpick comes out clean when inserted. Let cool, and cut into squares. See how to make a brownie even better! Sweet and succulent! Mine turned out yummy. It's perhaps a little too much caramel, though. Next time I'll decrease the caramel for a little more brownie taste. Thanks for the recipe!